The Montemaggio Estate is located in Radda in Chianti in the heart of Chianti Classico region. It is situated where once a 14th century tower stood above the old Roman road between Siena and Florence in Italy. Montemaggio also is featured on a map, dating back to 1560, of the “Captains of the Guelph Party” that is housed in the Podesteria di Radda (City Hall). The name Montemaggio derives from “Monte Maggiore” (Big Mountain), which indicates its elevated position. 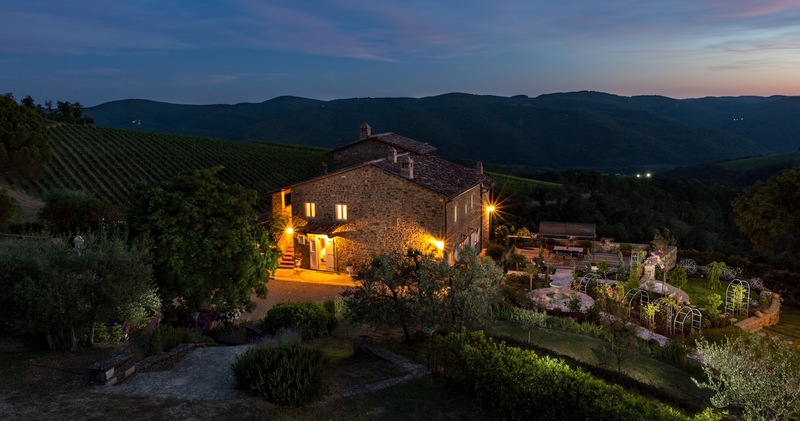 The estate, which is a member of the Consortium of Chianti Classico, extends over an area of 70 hectares (about 190 acres) of vineyards, olive groves and woods; it is situated at a high altitude of 450 to 600 meters above the sea level. The vineyards, which is comprised of 8 hectares (20 acres) has a central position in the estate with an exposure to southwest of remarkable importance. The soil is rich on galestro, sandstone, and alberese. The main grape varieties in our vineyards are Sangiovese, with small additions of Merlot, Pugnitello, Chardonnay, Malvasia Nera, and Ciliegiolo. The particular position of the estate combined with the micro-climate, makes it possible for Montemaggio to offer a wide variety of products. These products are the following: Chianti Classico, Chianti Classico Riserva, Chianti Classico Gran Selezione, Torre di Montemaggio IGT, Quinta Essentia di Montemaggio IGT, Ilaia di Montemaggio IGT, Rosé di Montemaggio IGT, Chardonnay di Montemaggio IGT, la Grappa e l’ Extra Virgin Olive Oil. Montemaggio follows the concept of a very high quality “Terroir” wine. We have a chance to look at the quality of wine in every bottle and make sure that customer gets a very special product. The wines have been planted with a very high density per hectare (6250 plants/hectare in some vineyards). We then produce a lower quantity of grapes per hectare (35-60 Ql/hectare, depending on the vintage), by regulating it through pruning and selection techniques. The most used vine training systems are cordone speronato (spurred cordon), alberello (head-trained bush vine), and guyot. These characteristics, in addition to the exposure (south – south west), the slopes, the micro-climate, the soil and the hard and accurate work done, guarantee the production of excellent and authentic Tuscan wines. During the harvest, every bunch undergoes considerable selection in the vineyard and later again in the vinery. Harvest is carried out manually, and only when the grapes are perfectly ripe. Therefore, it could be said that Fattoria di Montemaggio’s wines are 100% hand-made, and they preserve all the quality of the elements that are a part of the land where they have been cultivated. Furthermore, Montemaggio is a certified organic estate since 2009, which means we produce pure organic wine. We practice organic agriculture and thus cultivation is carried out with the maximum respect for the nature, without introducing any foreign or chemical element that can damage the environment. To see or buy our wines, click here.